Connectivity is the coming big wave in diabetes, offering better tools to solve the ongoing problems of high A1c’s, variable blood sugars, and hypoglycemia. Advances in health care are now being brought about not only by clinicians or pharmaceutical companies but by telecommunication and software developers. Connectivity will make glucose control more accessible, more affordable, and bring greater clarity to day-to-day interventions. Tracking a wealth of data such as glucose readings, glucose trend lines, calorie and carb intake, activity levels, weight, and blood pressure is critical in diabetes care, yet collecting and managing this data remain great challenges for those with diabetes and their healthcare professionals. Ideally people with diabetes would input and upload this data from one or more meters, a CGM, a pump and other devices, and their health care professionals (or soon a ‘smart’ computer system) would collect, download, integrate, and analyze this data. When connectivity works well, accurate decisions can quickly be made to improve diabetes outcomes. Why doesn’t this process run smoothly? For starters, only the technically savvy have the know-how to collect and analyze this data. More importantly, the healthcare providers who would ideally download and analyze the data during office visits or via email or phone are already overloaded with data and don’t have the time. Adding to these people challenges, diabetes data lacks standardization. Medical images like X-rays and MRI results are easy to share because they exist in standardized formats like PDF. In contrast, diabetes data from meters, CGMs and pumps are presented in differing database formats. Diabetes data often stays locked behind the bars of proprietary software, as previously discussed in our Tidepool article. If you use two glucose meters even of the same brand, you or your doctor cannot collect these readings into a single database for analysis, much less integrate insulin doses from a pump with the glucose readings from most meters and CGMs. If you use multiple daily injections, you are really out of luck for tracking dosing data unless you manually enter each dose into another proprietary software program. Connectivity issues often exist because software developers have not taken the extra step needed to allow raw data to be exported. Even an error in a device’s time setting can prevent the device from downloading or introduce errors into clinical advice. Data transfer from a diabetes device typically involves too many steps to be convenient. Current Bluetooth glucose meters like the iBGStar, Telcare, and iHealth require multiple steps to initiate and complete the sharing process. Other meters can now be turned into Bluetooth meters with the use of Glooko's new MeterSyncBlue but they would likely have the same issues. Accu-Chek has also talked about a new meter called Accu-Chek Connect that would streamline this process. Automating and simplifying connectivity is needed to expedite the gathering of data and its analysis. What Can We Learn From Fitness Devices? Fitness devices, with an estimated 17 million "smart bands" shipping in 2014 and an increase to 45 million by 2017 provide a great model for diabetes. 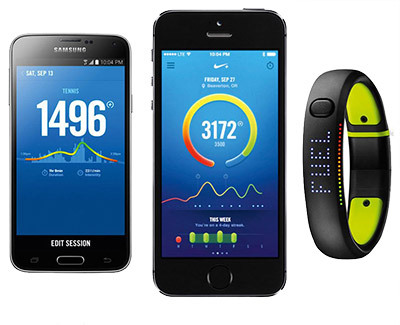 Wearable fitness devices like FitBit, Nike FuelBand, and Jawbone easily share data. They track data automatically and are easily synced to a smartphone and the cloud via Bluetooth. Fitness data can then be immediately viewed on your phone or sent to the cloud and shared with a clinician or family member. Other apps are available that can quickly integrate different fitness devices to display your speed, calorie output, elevation change, competitive rank, and more. Imagine diabetes connectivity paralleling fitness in the near future using today’s Bluetooth technology. Blood glucose readings could be sent to your smart phone from a Bluetooth enabled meter or CGM, along with meal data from devices like General Electric’s Easy Cal calorie and fat counter or any number of bite counter apps, insulin doses from a Bluetooth enabled insulin pump or smart insulin pen, activity from an accelerometer integrated within your CGM, blood pressure readings from a Bluetooth enabled blood pressure monitor, and weight from a Bluetooth enabled scale. Simply open up your phone and see graphs and charts with everything in one place. Then send data-enriched reports to others in real-time. Even better, an expert app on your phone or computer could search this integrated data to look for patterns and relationships, and then offer alternate suggestions that directly benefit your glucose stability, A1c levels, and health. Issues standing in the way of connectivity include data ownership and privacy. It may seem like your device company, your doctor, your insurance company, or the lab you go to owns your data. Yet you pay directly or indirectly for all of this. Your data should be freely and openly accessible to you and those you choose to share it with. Privacy is a larger challenge in healthcare than in fitness data, but technology companies can handle these privacy concerns as well as anyone with their experience in secure data transfer. * Bluetooth will be replaced gradually with Bluetooth Low Energy systems that can transmit up to 50 meters or 150 feet. You own and have access to all your health data. Your data cannot be shared with anyone else until you approve this. All health-related data must be easy to export in a standard database format. Connectivity will also speed up the collection and analysis of data by algorithms that provide suggestions for therapy. Consider someone whose fitness device tells them that they took 20,000 steps today (about 9 miles), well above their usual 4,000 steps. A well-developed insulin-dosing algorithm could simultaneously view their CGM and pump dosing histories to give three or four suggestions to avoid a night low, such as reducing their basal rate by 15% (85% of normal) from dinner till breakfast and adding 40 grams of free carbs that evening. The person is free to override or alter these suggestions as is currently done with bolus calculator recommendations, but they have access to better guidance derived from more comprehensive data. Feedback could be provided the next morning on the success of the treatment or ways to improve next time. Life with diabetes involves multiple health-related decisions each day. Advice about how much more insulin a meal requires, the onset of frequent hypoglycemia or hyperglycemia, starting or stopping a diet, or beginning to train for a marathon are needed sooner than your next doctor’s visit. These daily decisions can be simplified and handled at a lower cost once data is directed to smart phones with apps that provide guidance. FDA regulation is clearly needed for a closed loop that provides automated insulin dosing, but apps like bolus calculators and those that provide insulin dose guidance for changes in activity are far less complex and would provide value to most people on insulin. Monitoring of these simpler diabetes apps could be greatly simplified by having them post anonymous user data to a centralized database. Outcome data, the real key for improved care, could then determine whether app or software A, B, or C lowers A1c levels, reduces hypoglycemia, and increases the time spent in the target range. If an app or software receives the approval of 2 or 3 board-certified endocrinologists, it might be allowed to be tested in this way in the open market, since the user ultimately makes all the decisions. If an app or software does not perform well, the FDA might then reclassify it to a more restrictive category until it demonstrates that it can give reasonable advice. For supervision of diabetes software, the FDA might rethink its role and consider deregulation to speed advances in this critical healthcare area. How Soon Will Connectivity Occur? Users themselves are driving connectivity in a somewhat rough fashion to solve their own problems. 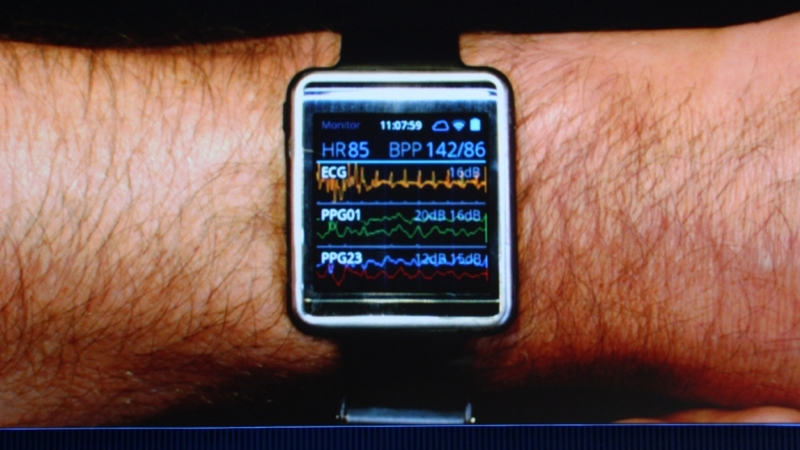 At a social networking event at the 2014 ADA conference in San Francisco, a gentleman was wearing a Pebble Smartwatch that read 154 mg/dl on its screen. Someone next to him asked if he had diabetes. He said no, that the reading was from his sleeping son’s Dexcom CGM back home that he had hacked to read out on his Smartwatch (See Nightscout Presentation). This homemade solution to distance monitoring though it still required cables shows the possibility for connectivity. Telecommunications companies are driving connectivity even further. Qualcomm is offering a $10 Million Tricorder XPRIZE for the team that can provide the first device weighing less than 5 pounds that can best diagnose and monitor 16 different diseases and 5 vital signs. The prize is named after a similar device first seen in the 1960’s TV series Star Trek. Fortunately, major players like Apple most recently and Samsung are looking to open systems up and make the accumulation and sharing of health data easier. These new platforms offer numerous ways to improve connectivity for better diabetes (and health) care and treatment. 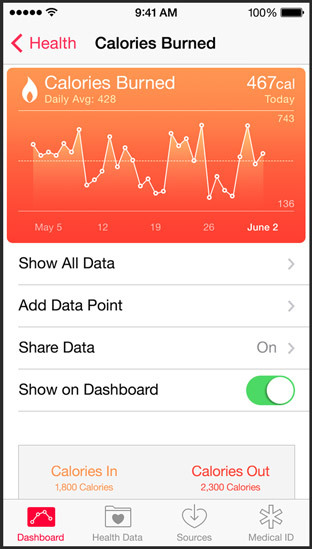 Apple announced their new app, Health, at their annual developer conference in June, 2014. The recent release of iOS 8 includes its Health software that can show device data collected from other apps using a free platform called HealthKit. Diabetes-related data might include weight, number of steps, calories burned, blood pressure, cholesterol, and ultimately blood sugar or CGM readings and insulin doses. Healthkit allows apps to connect into Health without partnership agreements. The data can be shared with other apps or healthcare professionals if the owner of the data explicitly says so. Health will also allow you to create an emergency card that is accessible without a password on the lock screen of your iPhone. If a family member or paramedic needs specific information to guide your treatment in an emergency, this Health Card provides this critical information. Apple partnered with The Mayo Clinic and Epic Systems (which accounts for over half of all medical records in the U.S.) to share records and data with healthcare providers. For example, a patient will be able to take their blood pressure at home and automatically pass this information to the Mayo Clinic’s new app. Their app will check whether the reading is within the patient’s healthcare parameters. If it is not, the app will contact the user’s doctor and allow the doctor to contact the patient immediately. Epic Systems’ integration with HealthKit will allow apps to pass to patient’s electronic medical record with reduced effort. A successful launch of Health along with the Mayo Clinic’s new app could encourage other companies to get involved. Samsung began working with health data collection in 2013 when it released the S-Health app on the Galaxy S4 android phone. In 2014, Samsung launched a Digital Health Initiative and introduced the Samsung Architecture for Multimodal Interactions (SAMI). SAMI is a cloud-based software platform designed to help consumers use and understand the health and fitness information that will be collected by their wearables. Developers creating new apps will have access to a variety of Application Programming Interfaces (APIs) that enable any type of device or online source to send data to any other device or application in real time. Samsung also announced their $50 million Digital Health Challenge fund that invests in startups and technologies in the digital health realm to stimulate innovation. They are encouraging companies to create wellness-related devices that use highly accurate, non-invasive sensors that work with advanced algorithms. Samsung’s expertise in semiconductors, sensors, and optics should speed development by talented people in the developer and wellness communities. Samsung recently displayed a wearable band for the consumer that companies can use as a reference called Simband. Simband has a modular design that allows other companies to add on their technology. A new company wouldn’t need to spend time creating a device from scratch. Instead, they could start with the Simband and replace some of its parts with their own to collect data and integrate it into the SAMI system. HealthKit and SAMI won’t fix the problems with data aggregation and health records on their own. Their advances, however, are a big step in the right direction. Encouraging, and even funding in the case of Samsung and Qualcomm, the creation of wearable devices that generate data for these new systems will speed progress. Because diet, activity, emotions, and insulin doses have such a direct impact on glucose levels, diabetes offers the perfect arena for connectivity solutions. Meter, CGM, insulin pump and food tracking software hooking into the same, standardized systems is the next big step. Once electronic medical record (EMR) companies come together and unlock the remainder of our data, we’ll have a complete health record. EMRs have been a longstanding headache since the American Recovery and Reinvestment Act of 2009 first introduced this mandate. Unless your family doctor and specialists all use the same EMR, they cannot see what drugs, lab tests, or procedures other physicians have ordered. This lack of information is costly and dangerous. Google and Microsoft both tried to improve this process with Google Health (shut down in 2012) and Microsoft HealthVault, but neither system was picked up the way they hoped. Dominant EMR vendors, such as Epic, Cerner, Allscripts and Meditech, may eventually create a single, integrated database that other apps can hook into. With everyone speaking the same database language and a host of apps using the new application programming interfaces (APIs), we might finally move towards a system that actually works for us, the people who pay for it. Everyone will benefit when we can finally record, analyze, share and receive guidance from diabetes and healthcare data. Let’s all encourage federal regulators and device and app developers to streamline the review process and speed new products to market. The following items suggest areas that need improvements in the push to increase connectivity. Blood glucose meters are reasonably accurate but readings are intermittent and have to be taken manually. Automatic uploading of readings via Bluetooth or Bluetooth Low Energy with data in a standard format would be helpful. Once again, each software is proprietary. Insulin dosing is critical from insulin pumps and insulin pens. Easy storing of data from proprietary software also is needed to move data to a single database for analysis. Events, blood glucose readings, foods eaten, exercise, stress levels, etc are best analyzed as a whole. Software for closed and semi-closed loop devices are expected to remain proprietary and device specific but may offer insights for less complex algorithms. The FDA should make it easier for devices to provide suggestions that address problems found during an analysis. Treatment standards would make it easier to determine good advice from bad advice. Sussman, A. et al, Performance of a Glucose Meter with a Built-In Automated Bolus Calculator versus Manual Bolus Calculation in Insulin-Using Subjects, Diabetes Sci Technol 2012;6(2):339-344.